After a wannabe wiseguy beat a man to death with a pickaxe in November 2011, he testified Wednesday that he frantically tried to reach the man he believed had ordered the killing by phone and texts. But Daniel Medaglia told jurors he was left stranded and the accused mastermind in the killing, Michael Doce, even faked his own kidnapping among other attempts to dodge him. Doce, 36, of Woodbridge, is currently on trial on murder and conspiracy charges in the beating death of Kelvin Dumo on Nov. 6, 2011. Medaglia, 32, has admitted he killed his friend Dumo with a pickaxe at the Viking Center in Sayreville and agreed to testify against Doce, who he says orchestrated the killing, as part of a plea deal. Doce has denied ordering the killing and his attorneys say Medaglia was deluded by a fantasy that Doce had mob connections that would provide him an entry to the criminal underworld. During Medaglia's fourth day on the witness stand, he detailed the night of the killing and the two hours he said he spent waiting for Dumo to help him clean up and get away from the crime scene. Medaglia testified he repeatedly texted and called Doce for help until his phone battery died. "Now I'm left hanging and I need a way out," Medaglia said from the stand in Judge Dennis Nieves courtroom. An hour later, after charging his phone, he received three messages from someone who claimed to have kidnapped Doce and was demanding a ransom. Medaglia did not testify to the amount. "Thank for your help, we've been waiting a long time to get him," the first text message read, according to Medaglia. He testified he believed the kidnapping was real. The kidnapping didn't seem too far fetched for Medaglia, who testified that Doce had told him about a previous kidnapping where he claimed the mob paid $500,000 for his return. On Thursday, Doce defense attorney, Melissa Geller, will have the chance to question Medaglia, an admitted pill addict, about the details of that night, as well as his account of his friendship with Doce. Doce's defense team has said their client told the fictional Mafia stories as a way to rebuff Medaglia. Doce didn't believe Medaglia had actually killed Dumo on the night of Nov. 6, 2011, his attorney Eric Breslin said in his opening remarks. 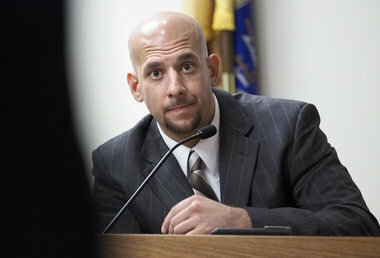 According to Medaglia's testimony, the hit on Dumo for $50,000 had been ordered by Doce's "Uncle Paulie." Doce talked often of an "Uncle Paulie," who he claimed ran the Genovese crime family in New Jersey, and he was his underboss, Medaglia testified. After the killing, though, Megalia testified that he began to question Doce's ties to the mob because he couldn't get in touch with Doce. "A light bulb went off that this might have been a scam the whole time," he testified. "I started getting worried that he wasn't who he said he was." Medaglia said he would later receive text messages from someone he thought was "Uncle Paulie" using Doce's phone, saying the kidnapping had been resolved and asked him what he did on the night of Nov. 6, 2011. "I believed he thought I had something to do with the kidnapping," Medaglia said of the texts he received around midnight, about six hours after the killing. Medaglia would later pass out at his friend's house in Dunellen, where he woke up to news reports about the slaying that hadn't been cleaned up. He then called Doce, who said he'd look into it, but he never heard back, according to his testimony. The next time Medaglia and Doce crossed paths was months later in county jail, Medaglia said. The trial, in its third week, is expected to last at least five weeks.